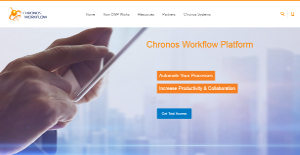 Chronos Workflow is a ready-to-use business process automation system. It can handle complex workflows and all the connecting documents via external interfaces and parallel processes. The product has the ability to implement workflows and quickly digitize processes without needing IT resources or coding knowledge. You can implement any type of workflow in any business area including R&D, product development, administrative, marketing, manufacturing/logistics, finance/supply chain, HR, and CRM. The cost of the service platform is the same as a single custom workflow development project and competitive compared to other services in the market in the US and Europe. Maintenance of Chronos Workflow is simple and cost efficient. With this platform, you can seamlessly convert your everyday tasks and documents into well-organized activities no matter where you are based. All employees can collaborate in a process-driven way at the right time with the right info and content. Chronos Workflow helps you to improve productivity by automating paper-based processes in a self-service way. This system can manage and file all your digital documents and ensure the content is always available for your processes. Plus, you can use real-time reports for operational improvements and measurable ROI. Built-in Graphic Process Designer helps you create and modify any process map seamlessly. You can design any number of process steps and routings for your workflow. Draw subprocesses and easily connect into a pernet workflow. Model complex flow structures built upon split, join, loop, and wait-for-construct. Modify the flowchart anytime you wish. Import from ARIS or MS Visio. Faster task response with workflow steps delivered to your ToDo list. View all tasks in a list or group view. Deadline can be shown for each task row. Urgent and priority job tasks can be highlighted with a different color in the list. Unique info can be shown in the task name. Use escalation and task expiry notification emails for one or every process steps. Seamlessly complete any electronic task form on the easy-to-use administrator interface that makes it possible to change the forms content, color, and field layout in minutes. Plus, you can select from more than 50 popular field types using a drop-down. Unique field types for more efficient form completion and data visualization. Picture/QR/barcode upload directly from mobiles or handheld devices. Choose field visibility in each process step. Modify form layout, background color, and field text. Use the robust email notification settings to let your workflow run seamlessly. Notifications are based on specific happenings (step transition and task due date expired). Use your unique email templates for escalation emails. Day-end escalation emails list all the overdue job tasks. Define deadlines or SLAs for any process steps. Set process step time-intervals. You can track any of your workflow data for further analysis and process or staff performance improvement. Chronos Workflow’s powerful built-in report and ad-hoc reporting generator makes it possible. Plus, you can get performance and statistical reports from any process data and information as well as a calculated fields report and scheduled reports. Export reports to Excel and share with team members. Historical reports are possible as you can save and track the changes-per-record. You also get a Graphical Process History feature. Finally, for audit trail every process step parameter is stored and everything can be checked, retrieved, or restored. Unlimited users and process numbers licensing. Web-based and responsive form management and layouts. If you are interested in Chronos Workflow it may also be a good idea to examine other subcategories of Best Business Process Management Software gathered in our base of SaaS software reviews. Enterprises have diverse needs and requirements and no software solution can be just right in such a situation. It is futile to try to find a perfect out-of-the-box software app that fulfills all your business needs. The smart thing to do would be to modify the solution for your special wants, employee skill levels, finances, and other factors. For these reasons, do not hurry and invest in well-publicized trendy solutions. Though these may be widely used, they may not be the ideal fit for your particular wants. Do your homework, investigate each short-listed system in detail, read a few Chronos Workflow reviews, speak to the maker for clarifications, and finally select the product that offers what you need. How Much Does Chronos Workflow Cost? Contact the vendor and ask for a tailored license package for your business requirements. We realize that when you make a decision to buy Workflow Management Software it’s important not only to see how experts evaluate it in their reviews, but also to find out if the real people and companies that buy it are actually satisfied with the product. That’s why we’ve created our behavior-based Customer Satisfaction Algorithm™ that gathers customer reviews, comments and Chronos Workflow reviews across a wide range of social media sites. The data is then presented in an easy to digest form showing how many people had positive and negative experience with Chronos Workflow. With that information at hand you should be equipped to make an informed buying decision that you won’t regret. What are Chronos Workflow pricing details? What integrations are available for Chronos Workflow? Chronos Workflow offers multiple options for full integration with other business apps and systems. Database connecting options help the best automation and make this platform’s operation unique. On top of that, you can run batch programs between process transitions, use SOA/web-service connections, or even run your SQL queries. If you need more information about Chronos Workflow or you simply have a question let us know what you need and we’ll forward your request directly to the vendor.